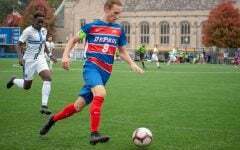 The wait is nearly over as DePaul gets ready to embark on its first season under men’s soccer coach Mark Plotkin. Plotkin was named head coach shortly before Christmas, and worked with the team in the spring culminating in a couple of spring games that both and players coaches said was an opportunity to build familiarity with each other. Senior midfielder Harry Hilling said the transition from the old to new staff has gone smoothly and helped the players on and off the field. 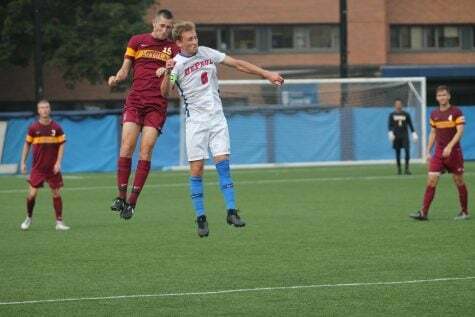 The senior, who appeared in nine games for the Blue Demons last season, added the team stayed in constant contact throughout the summer over group messages about what they were doing to stay in shape and the team as a whole is just looking forward to starting a new chapter. Coming out of the spring, Plotkin was pleased with what his team accomplished with a smaller roster that allowed them to spend more time focusing on individual players strengths and weaknesses, something he said will help when it comes to formulating a plan of what they want to do. Plotkin added they used the spring as an opportunity to get their players familiar with the vocabulary and some of the drills they like to run, so when camp kicked off last Wednesday they could hit the ground running. Senior defender Anton Sell echoed the sentiments of his new coach that the spring served as an opportunity for the players to get an idea of what to expect, which then allows them to take on more of a leadership role. After adding seven players during the spring, the Blue Demons also added five newcomers in late July. 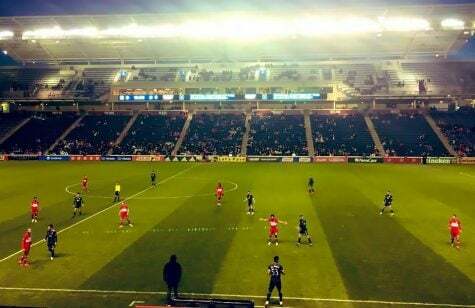 That list included three Big Ten transfers in sophomore goalkeeper Drew Nuelle and fellow sophomore Isaac Friendt from Indiana, as well as, Wisconsin sophomore defender Brayden Callipari. All three players are eligible immediately, although Callipari has currently been unable to practice due to injury. Plotkin has already been impressed with the championship experience Nuelle and Friendt brought with them from Indiana, who finished as the runner up to Stanford in the National Championship and are perennial contenders in the Big Ten. Plotkin added he has already seen those championship tendencies extend to their new teammates. Plotkin also said noted many of the freshman have impressed him and pointed to their upcoming two exhibition games against Western Illinois and Eastern Illinois as opportunities to see what they can do in a game environment, but he foresees playing at least a couple of them early. The former DePaul player, now head coach at his alma mater said the message has simply been centered on expecting more of themselves and more of each other. Focusing on doing the little details a little better is something Plotkin said will give the team a much better opportunity to win games. So far, Hilling said he has seen the team be more connected and pulling in the same direction after a frustrating 2017-18 season. 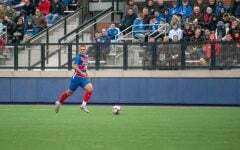 Both seniors also added having Plotkin, who played for the Blue Demons from 2006-09, has also been able to help players in their daily lives through networking and a student perspective with college still fresh for him. 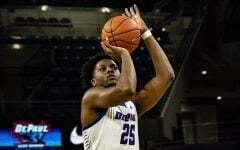 The Blue Demons open the season against Western Illinois on Saturday before returning for their home opener against Eastern Illinois on Tuesday.